An issue that many beginning players don’t realize that they have is their poor camera control. This article is intended to be a quick primer on camera basics. Some of these things could perhaps be better demonstrated in a video, but I’m a text kind of person. There are three common panning techniques: edge panning, WASD panning, and scroll wheel panning. Edge panning refers to bumping your cursor against the edges of your screen to move your camera. WASD involves pressing those keys to move your camera instead. Scroll wheel panning refers to holding down your scroll wheel (mouse 3) and moving your mouse to move the camera. I’m not familiar with all of the pros and cons of each method. However, I’m pretty sure it boils down to this: edge panning doesn’t tie up four of your (convenient) keyboard keys that could instead have been bound to other functions, whereas WASD allows you to move the camera while keeping your cursor in the same position. Scroll wheel panning allows for keeping the cursor in the same position without tying up your hotkeys. I’m in favor of using edge panning, partially because I hardly have enough hotkeys and partially because that’s the only panning method I’ve ever used. (In a typical game, I use around 20 keyboard buttons.) You should use whatever you are most comfortable with. When playing, you often want to jump back to your hero. This can be easily done with hotkeys. By default, your hero is bound to F1. I will always bind my hero to 1 as well, because 1 is slightly closer than F1. To do this, select your hero and press Ctrl + 1. By default, the numbers 0–9 are all separate control groups. Whenever you want to reselect your hero, press F1 (or 1, if you bound to 1 as well). To recenter the camera on your hero, double tap F1. Sometimes, events happen far away on the map. For example, a fight breaks out in another lane. You want to get vision of that event so you know what’s happening and can assess how to respond. The way to do this is by repositioning your camera via the minimap. Just click on the minimap and your camera will jump to that location. You should always use this method to gain vision of far away events, as it is much faster than panning to that location. One of the most common errors for beginners is poor camera positioning. Loosely, poor camera positioning means that the camera is not showing events, units, or areas that are important at the moment. Too much of the screen will be devoted towards looking at an area where nothing of interest is likely to occur. 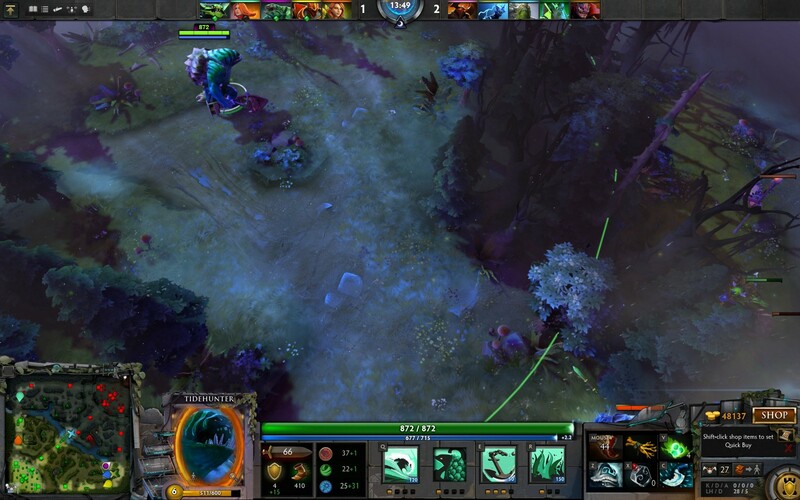 Even though the previous section said to always position via the minimap, that pertains to long range events. In the following examples, some are better suited for camera panning rather than camera jumping. In general, if you need to move the camera more than two camera screens, you should probably use the minimap. Otherwise, use panning. Suboptimal camera positioning for laning. Here, note that I have the camera such that my hero is almost center. Although this is probably the most intuitive way to position the camera, I don’t see very much on the screen. I can see the creeps that I want to last hit, but I have very little warning if an enemy hero shows up nearby. This example is even worse. The creep equilibrium moved out further, so I went further with it. However, I didn’t adjust my camera! Note how over half of the screen is devoted to the area behind me—where nothing is going to happen! Any Dire hero could walk up to me and it would be very hard for me to react in time. In fact, there’s an enemy Tiny in this example; can you see him? Even if you spot him, the camera angle makes him partly obscured. 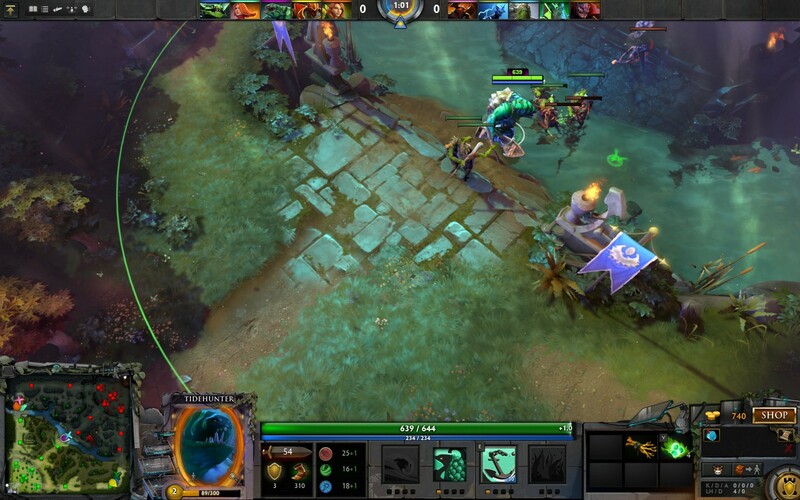 In this case, for laning, I want to have the camera positioning such that I can better see the creeps and enemy heroes. Once again, my creeps are walking forward. However, note how much easier it is to see the enemy units here. My camera captures my laning opponent. It’s also useful for me to be able to see any threats, such as the tier 1 tower. It’s also slightly easier for me to see any enemy heroes that are trying to gank me from the front. The next kind of mistake that people tend to make involving the camera is to focus too much on their hero when their hero is just walking around. In these images, I’m walking to top lane. The mistake that I’m doing here is that I’m spending a lot of time specifying my exact path. I’m clicking about 500–600 units in front of my hero, then clicking another 500–600 units, etc. 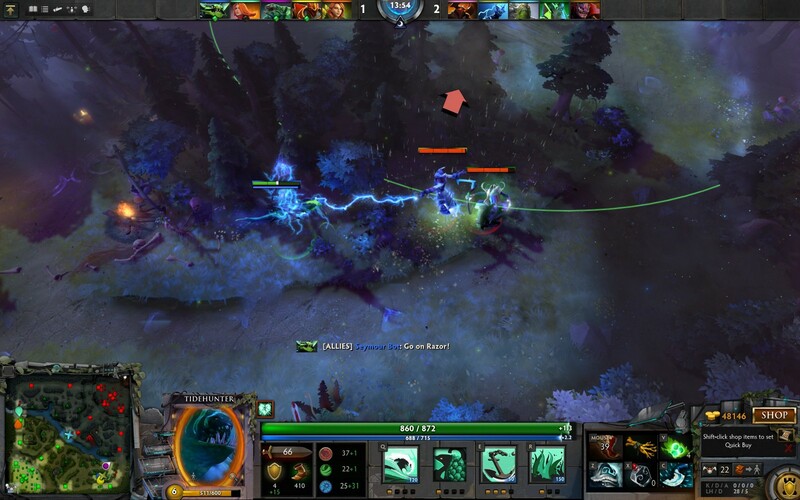 Although this type of movement is useful in other games, such as Diablo III, it’s less useful in Dota 2. In particular, watching your hero walk doesn’t accomplish anything when there’s nothing going on next to your hero! Focusing on the destination, not the path. Instead, when you want to get somewhere of importance, just put your camera there! 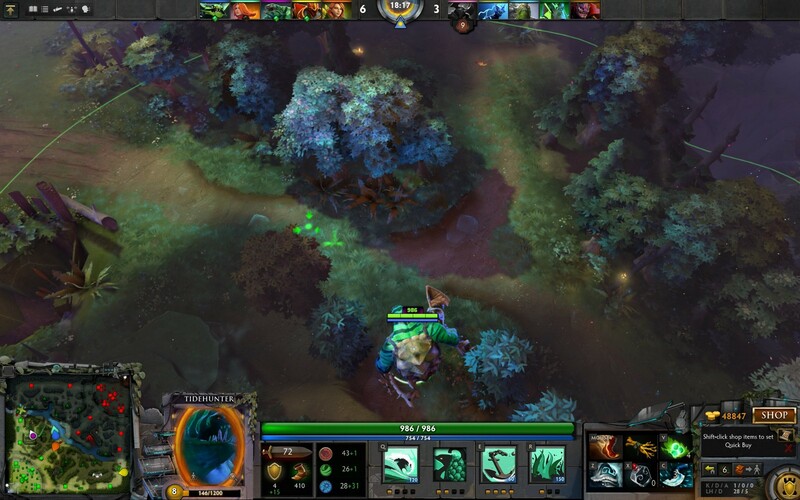 If you take a look at the minimap, you’ll see that my hero is near the tier 2 Radiant mid tower. I want to head to the top lane to fight, so I just position my camera there and tell my hero to move. I know that my hero is going to walk through a safe route, so there’s no need for me to focus on every little step of the way. Why is it important to see my destination if I can’t do anything until I get there? When do I want to focus on the path my hero takes? What if I’m walking through a dangerous area? What happens if I thought I’m in a safe area but I’m not? The reason it’s important to see what’s happening is that it could influence how you should respond to the situation. Perhaps the opponent takes an unexpected path. You can cut them off if you adjust to their pathing. Maybe your ally was only fighting one enemy hero and all of a sudden there are four enemy heroes. Instead of completing your walk, it might be time to TP. I mentioned it above, but the times that you want to focus on and watch the path your hero takes is when there are things happening in the immediate vicinity of your hero (within 1 camera screen). 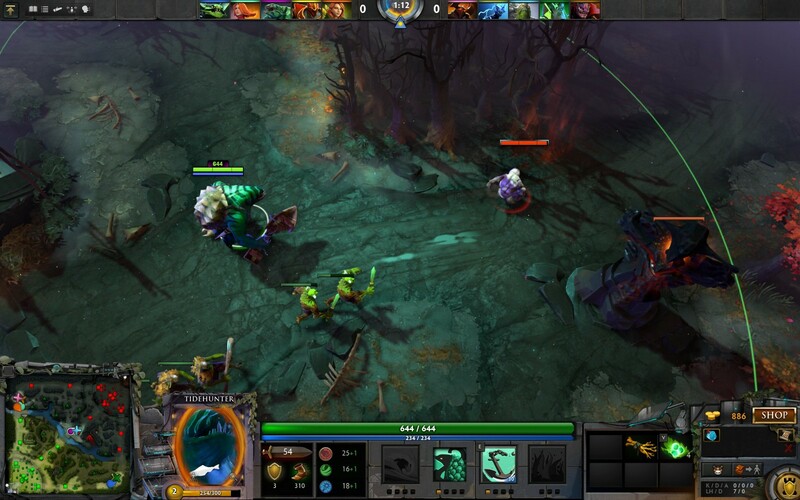 This involves things like juking heroes, chasing heroes, or trying to dodge various skillshots. If you walk through a dangerous area, it’s justified that you pay more attention to your hero. Still, you don’t want to watch your hero the entire time. Instead, bounce back between your destination and your hero. You can also shift queue a path that takes you through safer areas of the map. In this way, you’re increasing your control over your path without spending all of your time watching your hero. Finally, if it turns out you’re in a dangerous area, that’s really unfortunate! If you get hit by something (or notice something on the minimap), you can quickly bounce back to your hero with your hero hotkey. From there, just do your best to respond appropriately. The last thing I want to talk about for camera positioning is how you initiate. In particular, how you want to position when you have a long range initiation tool (such as a blink dagger). Trying to initiate on something I can’t see. Here’s an example of poor camera positioning. 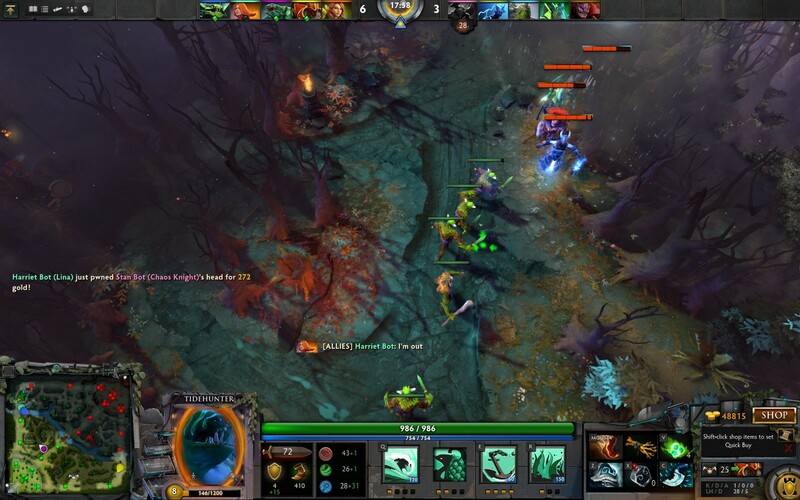 I’m trying to gank my team’s safe lane; I want to blink in and catch my opponents by surprise. My camera position is better than when I was laning Note how most of the empty space is in front of my hero. This is the area in which I might expect to find the enemy heroes. However, I actually already know where the enemy heroes are! My minimap tells me. The reason that this is poor camera positioning is that I want my camera focused on the area where I will initiate, not the area near my hero. Here, my camera is actually over the enemy heroes. I can see where and who I want to initiate on. Some of you might be a bit intimidated by this camera position because you’re expected to take action and you can’t see your hero. This will take some time to get used to. The important thing to be aware of is where your hero is, as this will let you know your initiation range. Fortunately, long range initiators are often able to find an area where they can just sit still and wait before jumping in, so their hero position won’t change. The choice of edge panning, WASD panning, or scroll wheel panning is up to you. I prefer edge panning since it frees up space for hotkeys and because that’s what I’m used to from Starcraft II. Use your hero hotkey whenever you need to quickly center the camera on your hero. Use the minimap to adjust your camera if you want to look at an event that is over two screens away. 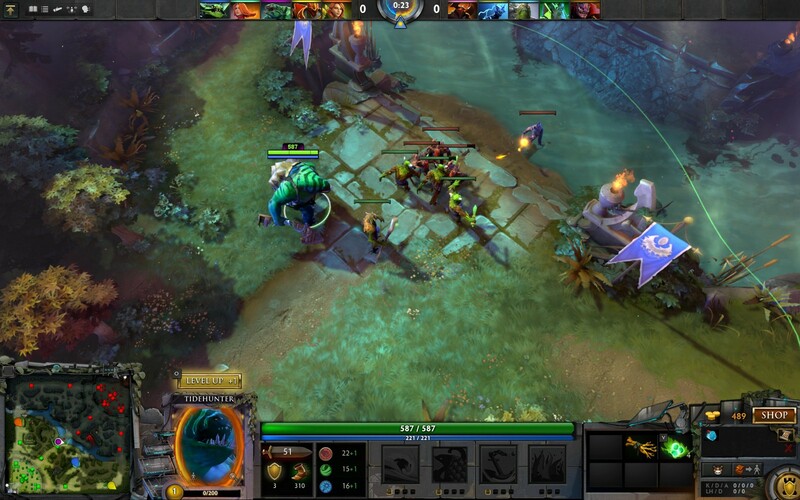 You want to position your camera such that you have vision of enemy heroes whenever possible. If you can’t see your opponent, it is extremely difficult for you to react to their actions! 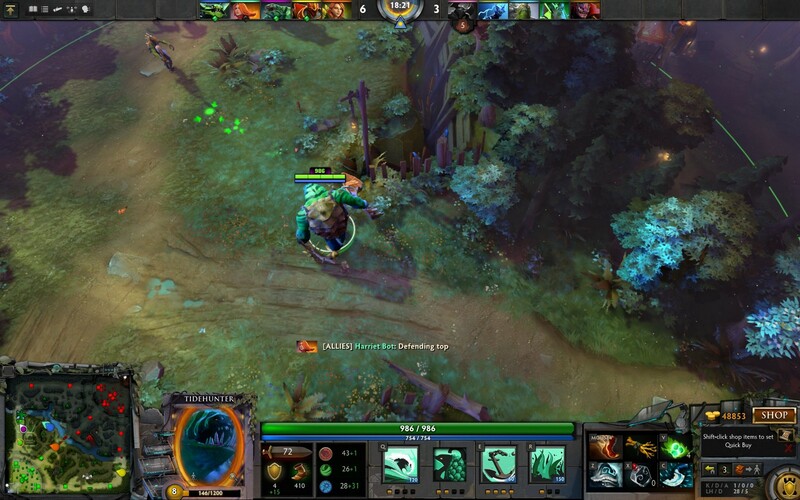 Tools and thoughts to help you become a better Dota 2 player.